Because we appreciate our numerous electric devices, but not the chaos of cables and chargers involved or the real dust catchers they become, LaPaDD is expanding its product range for the rationalisation of cables, power supplies, multiple sockets and chargers. Following the success of the SL12 Charge Box available since 2009, LaPaDD launches the BlueLounge range, from the United States. The Cable Box and Cable Box Mini are inexpensive, extremely well thought out and very easy to use. Made of fireproof ABS, with non-slip rubber pads, they are particularly well finished, and their simple look allows you to integrate them to your decor, whatever the style. Equipped with a slit on each of the small sides and an easy lift top, they are very functional. The Cablebox is an ideal box to hide a large multiple socket (up to 39 cm long) with all the ensuing chaos. It will happily stand next to your desk or behind the television. It perfectly manages the rationalisation of your computer, hi fi or TV setups, capable of making all transformers and power cables disappear. CableBox, 30€, available in black or white. The CableBox Mini is designed to take a smaller multiple socket (22 cm max), a USB hub or a mini Ethernet router. Its compact format allows you to keep it at hand for an easy access to your mobile charger or your hub, whilst confining the mess of cables, guaranteeing order on your desk. 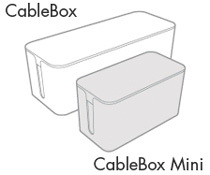 CableBox Mini, 21€, available in electric pink, black or white.